2008 has a Northern style, a cooler year than 2007 for example. An Indian summer allowed late harvest varieties, such as Mourvèdre and Counoise, to reach perfect maturity. Selection in the vineyard was ruthless and production was 50% less than an average harvest. The wine is quite “northern” in style and is very elegant with a lot of finesse and great balance. This wine will be delicious young and has an ageing potential similar to that of 1988. Château de Beaucastel has long been considered one of the great wines of France. It is unanimously renowned for its balance, elegance and ageing potential. Beaucastel has an extraordinary terroir at the Northern end of the appellation with a lot of exposure to the Mistral. All 13 varieties of the appellation have been organically grown here since the sixties. Beaucastel grows all thirteen grape varieties authorized by the appellation. Nose: very rich in ripe black fruit, cherry, fig and slightly smoky. This complex vintage reveals an expressive nose all in finesse. The notes of freshness and spices make it possible to get a balanced mouth A very pleasant wine to enjoy today. The 2008 vintage signs a great wine. Beautiful colour with bright undertones, beautiful mature nose with animal notes, this wine is very fresh on the palate, with nice drinkability and a beautiful length, recalling the style of 2001. Sometimes the presentation and reputation of a bottle suggests a match and so it proved with this handsomely packaged bottle of Chateauneuf du Pape. Undecanted it exhibited an intense richness and sweetness that made me immediately think of occasions like Thanksgiving and Christmas. It would be a splendid bottle for a turkey, especially with the classic accompaniments of squash and sweet potato - also with a handsome leg of pork. Decanted it became more structured and savoury, suggesting slow cooked beef rather than turkey or pork. Beef shortribs would be a great pairing. Ripe, sweet, but really well defined black fruits nose with complex notes of meat, liquorice and floral black cherries. So expressive with lovely balance between the sweet ripe fruit and the more savoury olive and meat characters. From a cooler vintage, this has a touch of the northern Rhône about it, and it is fabulous. This wine does not reflect the characteristics of the appellation of Chateauneuf du Pape. The weakness of the vintage makes the strength of this wine showing a very aromatic nose and a perfect balance between finesse, power and elegance for a vintage that is already ready to drink. Very floral nose with a dominant rose and peony. Crunchy and delicious with a wonderful aroma. A beautiful freshness, a crystalline side. Of greed in its purest form. The 2008 does not have the structure and extent of other vintages but it seems like a very nice wine for the vintage. Beautiful digestibility, immediate pleasure. Ripe and very sleek, with a dense core of cassis, blackberry, anise framed by violet and spice. The long finish drips with juicy fruit and subtle toast, with a flash of iron boding well for cellaring. Shows great freshness and balance for the vintage. Marc calls this ‘quite a Northern style’. Already quite open, the nose is immensely inviting with notes of liquorice, roasted game, blackcurrants, violets and garrigue. Beautifully focussed yet opulent texture, quite full on the palate with silky tannins, good freshness, and a long finish. Wow – a Beaucastel that can be enjoyed over the next decade instead of after two decades! A superb showing by the 2008 Château de Beaucastel Châteauneuf-du-Pape and a very complete wine that will surprise people who think ‟08 was a poor vintage. Showing solid complexity and an open personality, with aromas of meat, lavender, garrigue, and licorice, medium body, solid concentration, and plenty of length, this will be a relatively early drinking wine by Beaucastel standards. Never the less, it should continue to positively evolve for 3-5 years and have 15 years of longevity. 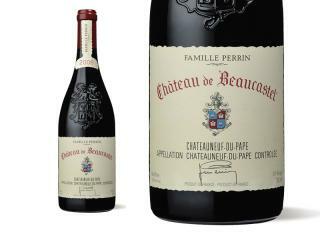 The 2008 Beaucastel Chateauneuf du Pape is one of the few outstanding wines produced in this vintage. More evolved than Beaucastel’s wines tend to be, it reveals a healthy dark plum/ruby color, notes of licorice, meat juices, smoked game, black currants and garrigue, medium to full body, silky tannins, good freshness, surprising depth for the vintage and a long finish. Drink it over the next decade. One of the deepest crimsons of the lot. Funky nose with buckwheat and vegetation, then rather severe strict medicinal aromas. Very tough tannins on the finish. Pretty dramatic and tight. Medium to dark ruby in color, this wine smells of mulberry and wet stones, with a hint of dried fennel seeds and crushed herbs in the background. In the mouth, tight tannins wrap around an equally compact core of raspberry and cherry that sits on top of a deep earthy and mineral core. Good length and breadth. A cold and rainy vintage with yields down roughly 50% from normal. Ripe and very sleek, with a dense core of cassis, blackberry and anise framed by violet and spice. The long finish drips with juicy fruit and subtle toast, with a flash of iron boding well for cellaring. Shows great freshness and balance for the vintage.